June 11th, 2011 was the first workday Blankets for a Brighter Day scheduled. We had a great turnout. 40 blankets were either made or donated that day. Thank you to everyone who came! 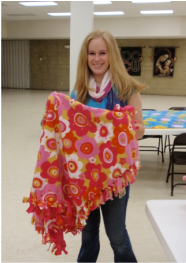 The United Methodist Group - SEWMUCHNEED donated 9 blankets! Thank you.